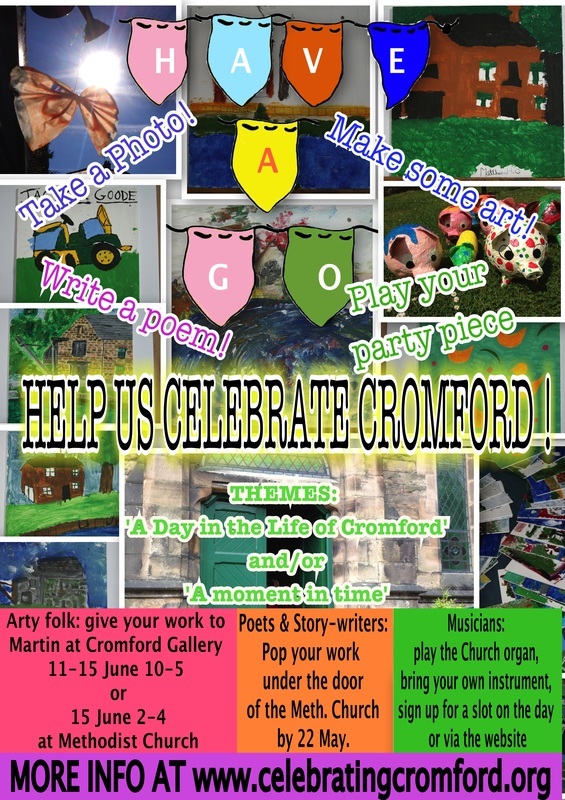 Themes: "A day in the life of Cromford" or "A moment in time"
* Show your photos, videos, paintings, sculptures, textiles ......... Whatever you fancy. Give your masterpiece to Martin at Cromford Studio and Gallery 11th -15th June between 10 am and 5 or bring it along to the Methodist church on Sunday 15th June between 2 - 4pm. * The pupils of Cromford School and Anthony Gell School are busy writing poems for exhibition too. We'd love to have poems from anyone under 18 who lives locally, just pop your poem under the door of the Methodist Church by 22nd May. Remember to add your name and age (children only) to your artwork or poem. Budding church organists or pianists who fancy performing a piece on the organ in the Methodist church will have a chance to 'busk' during the weekend. We would also like to open the space in the Church up to young musicians playing other instruments who may like to show off their party piece. Sign up for a slot on the weekend itself, speak to Rachel Walker or contact us at action@celebratingcromford.org.